Rose Marie Lodoen was born on Oct. 16, 1926 to Leon and Victoria Buye. She passed away peacefully in Maple Creek, Sask. on March 3, 2019. She was predeceased by her husband Ben in 1990, her brothers Nick and Edward and sisters Eva, Tillie and Alice. Left to cherish her memories are: her children Lester (Laura), Alden and Barby (John); her grandchildren — Elise, Royce, Casey, Amie, Amanda, Johnathon, Janice-Rose and Jamie-Lee and her great grandchildren —Tori, Leah, CoIe, Shea, Tucker, Shelby, Brooke, Sutton and Mazie; and her siblings, Anne, Josie, Alex, Andy and Pearl. Rose was born on the family farm east of Fox Valley. She was the fourth child born in a family of 12 children. She described her growing up years as hard times but good. She walked 2 1/2 miles to attend Bowden school where she completed her Grade 10. 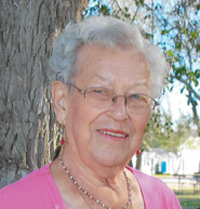 In the Fall of 1942, she moved to Maple Creek and worked for her room and board so that she could complete her Grade 11 and 12 at the Jasper School. In 1944-45 she went to Moose Jaw and attended Normal School to become a teacher. She received her teacher’s certificate and started teaching at Ingebrigt school in the Fall of 1945. In the one room school she had 59 students and taught Grades 1 to 10. On Nov. 23, 1951 she married Ben Lodoen and after that there was no more teaching as she was busy being a farmer’s wife. Their marriage was blessed with three Children — Lester, Alden and Barby. As her children got married and blessed her with grandchildren, they became her pride and joy! She lived 51 years on the farm. In 2002 she moved into Fox Valley where she lived the rest of her life. Rose loved to garden and did not miss a year in having a big garden! She enjoyed cooking and still prepared full meals when she was in her 90’s for anyone that stopped in. She also loved to visit with people wherever she went. Some of the highlights for her were: her trip to Norway in 1976 to see where her husband Ben had come from, trip to the Crystal Cathedral in California in 2005 and her trip to Ukraine in 2007 to see the homeland of her father and meet family that still live there now. Rose kept active and remained independent in her own home until just a few days before she passed away. The funeral service took place on Saturday, March 9, 2019 at the Fox Valley Community Hall with Pastor Hans Martens officiating. In memory of Rose donations may be made to Telemiracle, 2217C Hanselman Court, Saskatoon, SK, S7L 6A8 or www.telemiracle.com. Condolences may be offered to the family at binkleysfuneralservice.com.